First race done! Well, that was actually pretty rad. It was hard enough to feel like racing and to remind me that I do actually miss it in some perverse way, but it was short enough to feel, well, fun? Yup. The fact that I got to do it with three awesome friends is what really made the day - I wish every race were this much fun. The Sugarbush Triathlon is actually four events: running, paddling, biking, and skiing; pretty much a great way to give shoulder season a nice big bear hug and a good excuse to hang out with cool people. Our team was pretty last minute in pulling things together. There were big plans for costumes that never happened. In the end we settled on a let's pick up some pbr and have fun strategy. That seemed to work okay. Nina ran a wicked fast running leg, passed off to Anne who raged the paddle in style despite a boat that was better suited to touring a lake than racing down a river. Oh well, plus she didn't know she was racing until the day before...good planning on my part. I did the bike leg, which went about how I'd hoped. There are some opening rollers along the Mad River which allow you to open things up and then recover on the backside. Then it's some big ring cruising at tempo through Waitsfield and up 17. That was the fun part; down in the aero bars goin' real fast. German Flats to Mt. Ellen is tough. A pretty solid climb and my 42t granny was making me work for it. Got the 5th overall split for the bike leg though, which is a good indicator that I'm about where I want to be right now. Pete brought it home on the ski leg. Sorry dude, that was by far the worst one. Nice soft pea soupy corn snow - perfect for brutal skate skiing. Fortunately, memories are short and I think everyone, even Pete, wants to go back next year. In the team category, we killed it. We know, we're modest. Well, really we didn't think we were going to do well at all. Turns out we were 2nd in our class and got some rad pint glasses. So that was cool. Plus it was sunny all day, also cool. And it was just fun to hang out and eat some yummy chili with the legs up on the back deck of Mt. Ellen after the race. All around, a perfect way to start the season. P.S. Sorry for the so-so images. I kind of failed on the photography front. But the kayak transition was a good representation of the race as a whole: lots of cool people coming out to embrace shoulder season and have a good time together. 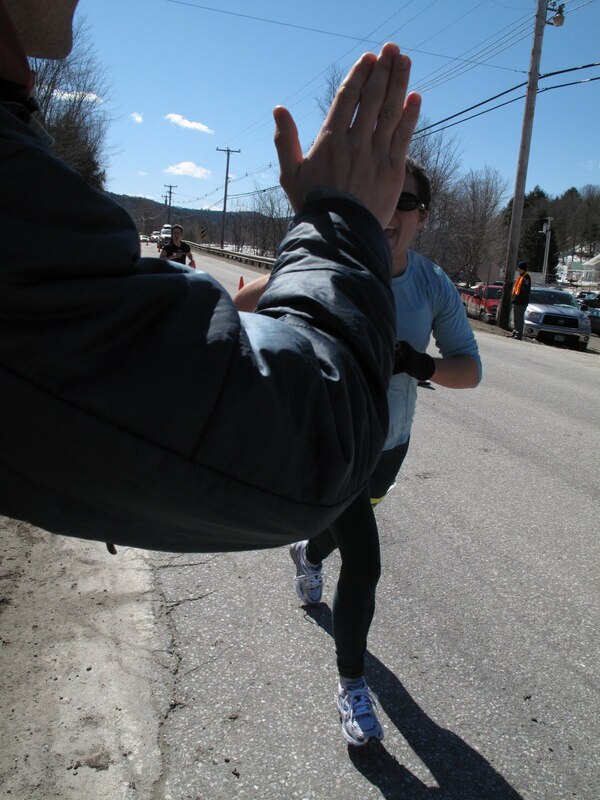 The Sugarbush Triathlon is super fun; hope to see you there next April.